This Brampton log basket is a wonderful cross between a functional design and a breathtaking accessory. 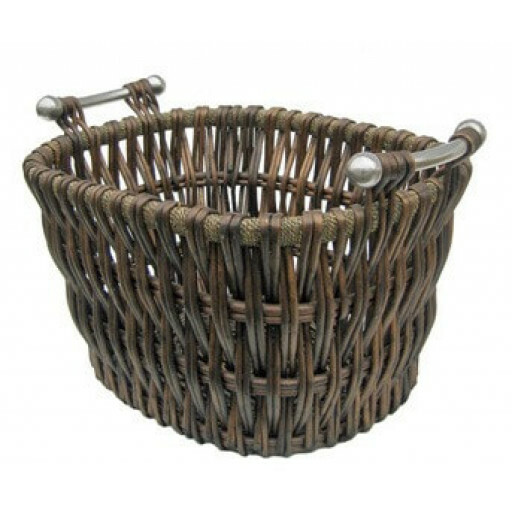 The wicker basket brings a natural touch and the pewter-effect handles make it easy to grip. Able to hold plenty of fuel for the fireplace, this basket works well in both contemporary and traditional decor. The tight weave of the wicker makes it useful for transporting logs as well as solid fuels like coal or coke. The strong construction and solid base give it the ability to carry loads of all sorts for many years to come. The tactile handles will give you a solid grip while moving the basket from one place to another, whether empty or full. The Brampton log basket is more than just a fuel-transport container. It is decorative and functional enough to be used all over your home. You can use it to air linens or store your children's toys. It can contain throws for chilly nights in front of the fire or extra blankets in the bedroom. If you need a strong, sturdy container anywhere in your home, this is the basket for you. This stylish container measures 350mm high, 550mm wide, and 440mm deep. That gives it sufficient volume for a hefty load of fuel to keep you warm through the winter months. was looking for a new log basket for housing logs for my wood burner in my conservatory and went along to the fireplace warehouse in Burnley where I had purchased my stove from last year and purchased a Brampton wicker log basket from them which was in stock for me to take away the same day great service from the salesman who I dealt with.